While I doubt the conversation among the neighbors who shared the same party line as my grandparents ever got as racy as it did between Doris Day and Rock Hudson in Pillow Talk, I would venture a guess that there was more than the occasional eavesdropper who picked up a ringtone that didn’t belong to them and hoped to pick up some juicy gossip to share over morning coffee. It baffled me that instead of hearing a dial tone when you picked up the receiver you might hear someone else’s conversation and you couldn’t use the phone until they were done, not to mention the fact that the phone might ring all day long and not a single call would be for you. In those days the pattern of “briiiings” designated the family and everyone knew which pattern belonged to whom and there was nothing to stop someone from picking up the phone “just because.” I wonder if people, especially teenagers, had secret codes to keep their neighbors and parents from knowing what they were up to. As technology evolved households moved from party lines to private lines and teen lines. I’m not sure if the person who originated the concept of a phone line dedicated to teenagers was a brilliant marketer for the phone company or the frustrated parent of a fourteen year old girl. In any case, I’m sure I wasn’t alone in thanking them for my privacy and freedom from phone call time limits. (Who knew that the concept of “charging for minutes” may have originated thirty-five years ago). 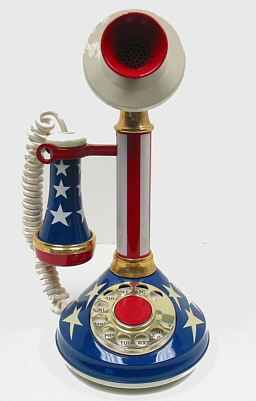 I spent hours with the base of my red, white, and blue candlestick phone resting on my stomach and the phone piece propped against my ear sharing secrets and giggling dreams. We didn’t have caller ID or voicemail, no one worried about having their number published in the phone book, and the biggest risk of being embarrassed was that a younger sibling was brave enough to listen in and repeat what they heard. Our social network was our friends and their parents, we wouldn’t have considered sharing personal information with strangers, and my biggest fear for an hour or two was how my parents discovered my plans and whether or not the ‘bugaphone’ they claimed to own was real or not. The biggest decision was whether or not to answer the phone and parents taught kids about technology not the other way around. If it weren’t for my daughter, managing my landline would still be a mystery. “Mom, do you know what the rapid beeping noise is when you pick up the phone?” Katie asked. “The mailbox is full. No more messages can be received. Please delete old messages,” the mechanical voice said. Nowadays I when I want to share something I have a hard time deciding if I should update my status, pin it to a board, write on someone’s wall, or post something to my blog (and if so, which one). I try to remember who will see what depending on which one I choose and I wonder if my automatic tweets fool anyone into thinking that I actually understand Twitter. Then of course there are private messages, emails, text messages, Skype, and last but not least the option of an old fashioned phone call or handwritten letter to share information of a more private sort. Although based on what I see some people post and tweet I’m not sure that everyone understands they have other options. Looking back it doesn’t seem like listening for “two shorts a long and a short” to know the call was yours or the notion of eavesdropping on your neighbors was complicated or foreign after all. This might be a great piece for AARP or a retirement type of publication. What cha’ think? This brings back lots of memories. I loved it. Groovy phone, man! Antique Roadshow for sure!